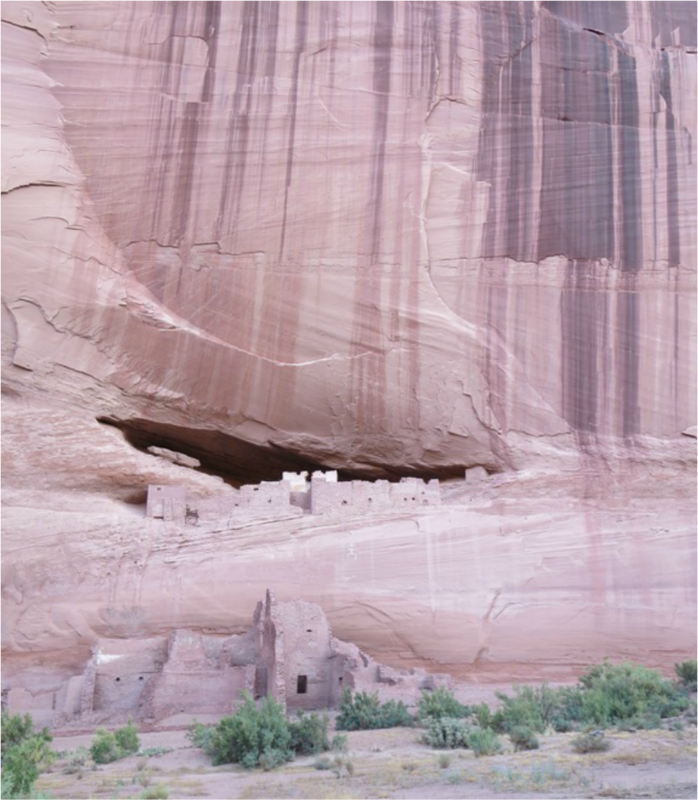 Canyon de Chelly National Monument on the Navajo Reservation in far northeast Arizona combines breathtaking natural beauty and a tragic story of America's failed resettlement of close to 8,000 Navajos to Fort Sumner in New Mexico in 1864. Col. Kit Carson forced tribal members out of the canyon on a 300-mile journey known as the Long Walk. The relocation took its toll on the Navajo through starvation and disease. They returned to northeastern Arizona in 1868 after signing a peace treaty. Canyon de Chelly and the adjacent Canyon del Muerto include ruins from ancient Puebloan people who have lived in these canyons for 5,000 years. 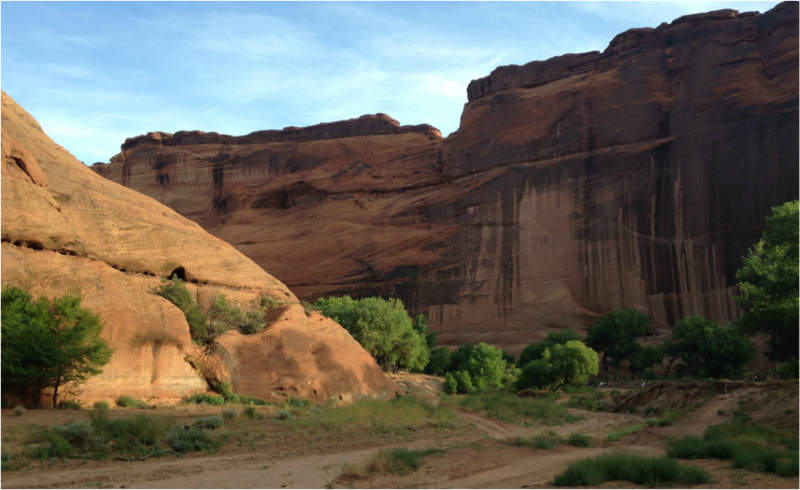 Navajo families live in hogans at the bottom of the canyons, raising sheep and growing alfalfa, corn and fruit orchards. Spider Rock, an 800-foot sandstone spire, is the monument's most recognizable landmark. Guides are required for most inner canyon tours except for a 2.5 mile roundtrip hike to the White House Ruin. Motorists can view the canyon from scenic overlooks on the South Rim (37 miles roundtrip) and North Rim (34 miles roundtrip). Don't feel obligated to tour both rims. Drive the Southr Rim to reach Spider Rock. A campground with limited services and the Thunderbird lodge are at the mouth of the canyon. Rooms cost about $100 to $130. Temperatures can be cold and windy generally from November to February or very hot from June though August with sudden thunderstorms common in late summer. 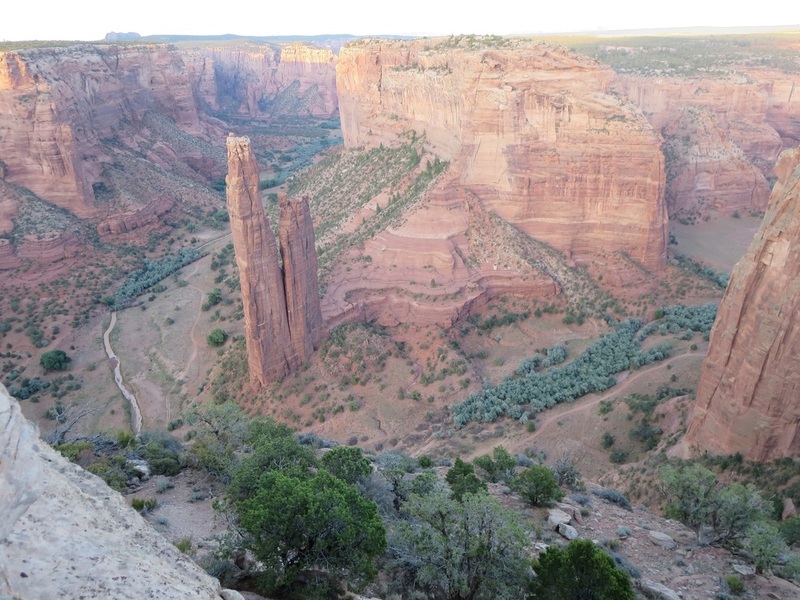 Spider Rock, an 800-foot sandstone spire, is at the junction of Canyon de Chelly and Monument Canyon. A datura flower in the morning sun. Visitors can hike 2.5 miles roundtrip to the cliff dwelling at White House Ruins, the only trail available without a guide.